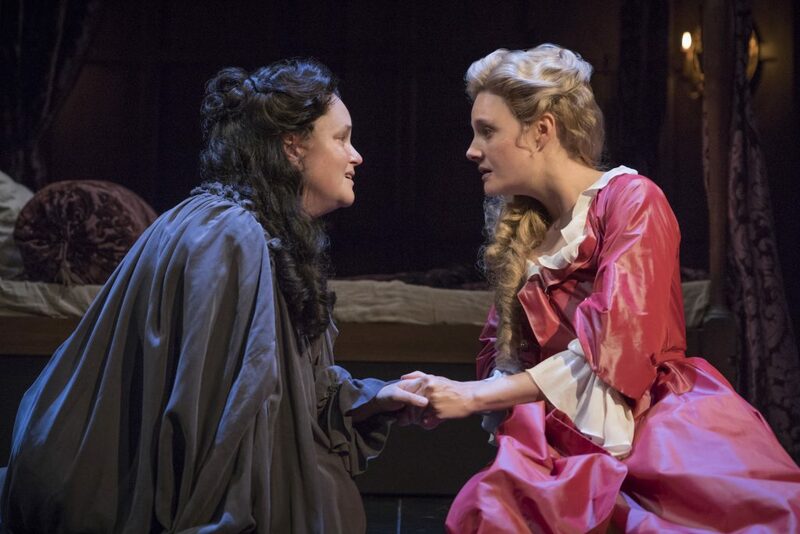 Emma Cunniffe & Romola Garai in Queen Anne. Images Marc Brenner. 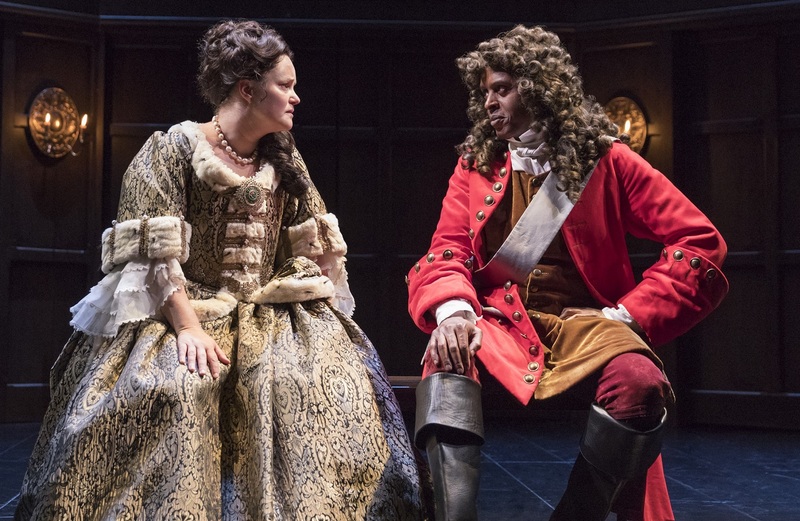 At a time when Britain is looking at breaking away from Europe it’s fascinating to watch a period drama like Queen Anne that explores the reign of a woman so involved in creating a cohesive union on her own shores. It’s also refreshing to watch a play with three strong female leads. 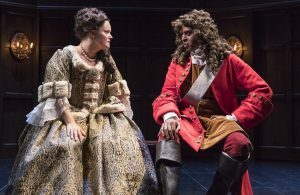 But the Royal Shakespeare Company’s production, which has just opened for a summer season at London’s Theatre Royal Haymarket, struggles to conjure up enough of a thrilling story to keep audiences entertained and engrossed for nearly three hours. And that is a sin. 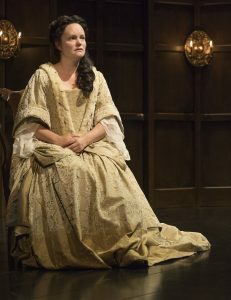 The RSC, and writer Helen Edmundson, have thrown their weight behind the popular image of Anne as being dull and dumpy, and lacking both charisma and intellect. That may have been true but it is also recognised today that poor Anne has been cruelly besmirched by her detractors. Great Britain, formed during her reign, enjoyed a purple period of growth and prosperity, both in the economic and political sense and in the arts. But Anne came under attack from the great satirists of the era including Jonathan Swift, Daniel Defoe and Arthur Maynwaring whose outspoken views appeared in popular pamphlets. Far worse, her reputation was later decimated by the very woman she considered her childhood friend and closest ally, Sarah Churchill. Edmundson’s play tries to focus on their relationship but it occasionally veers off tangent to join the lampooners in the London coffee houses, trying to cram too much historical context into the plot. It is a dilemma for director Natalie Abrahami. You obviously can’t rely on your audience being entirely au fait with British constitutional history but you need to include some framework that explains this watershed moment in its past. 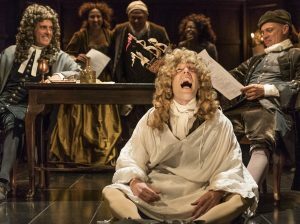 And, despite the 18th century being very much a man’s world, Edmundson and Abrahami are determined to sideline their significance and achievements in his feminist production. Daniel Defoe, author of Robinson Crusoe, journalist, businessman, spy and political activist, is here reduced to a walk-on part. Hywel Morgan’s Prince George, husband of Anne, is portrayed as a bit of a buffoon. John Churchill (Chu Omambala), one of our mightiest warriors and warmongers, is let down by Edmundson who portrays Europe’s great general as weak and under his wife’s thumb. And much time is spent listening to Chancellor Sydney Godolphin (Richard Hope) and comedy Commons Speaker Robert Harley (James Garnon) spouting exposition to try and keep us all on track (no mean thing if you don’t know your Whig from your Tory). All of this detracts from the real story, the nature of the relationship between Anne, Sarah and, later Abigail Hill, a lowly but connected servant who married well and ended up having the queen’s ear. 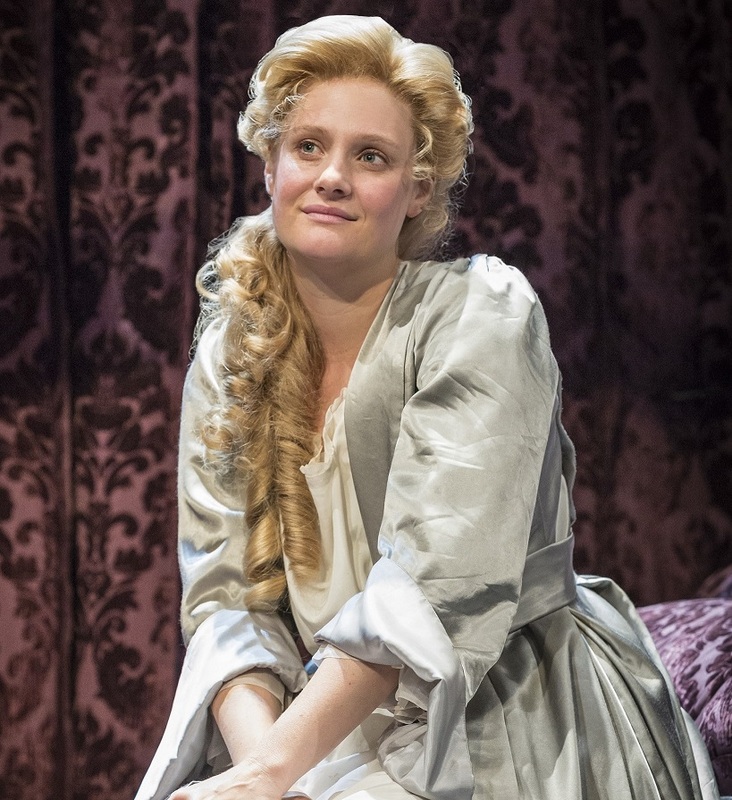 Sarah Churchill was undoubtedly the power behind the throne. Beautiful, highly ambitious, headstrong, independent and forthright, she was never afraid to express her opinions, no matter how unflattering. Sarah and Anne met when they were small children and gave each other nicknames – Mrs Morley and Mrs Freeman – to allow them to remain close and unaffected by royal protocol. Romola Garai, as Sarah, is occasionally brilliant but frequently too bitchy to be effective. She flounces and throws tantrums rather than plot and connive. Abrahami’s weak and patchy direction fails to bring out any depth in her characters. Emma Cunniffe does her best as Britain’s queen but there’s only so much pathos you can wring out of the part. Anne lost 17 children, in as many years, and the pregnancies took a terrible toll on her body. She became bloated and suffered from gout. The audience is treated to the sight of her horribly ulcerated legs being bandaged. It’s not pretty. The queen is in pain and poor Emma spends the entire performance gripping her side and wearing a tortured expression that seems to suggest severe constipation. 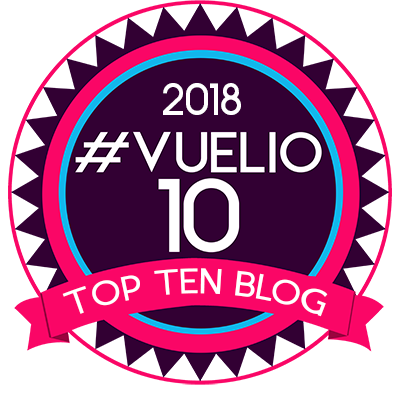 There is the smallest suggestion of a possible lesbian relationship between the two women but it is forgotten once Hill forces her way into the bedchamber. Sarah throws another hissy fit at her advice being ignored and storms off. Hannah Clark’s dark, Jacobean, wood-panelled set (complete with sticking doors), does nothing for the production and the candlelit stage (aided by a couple of spots) simply adds to the Stygian gloom. There is a thrilling story here which is just waiting to get out but this isn’t it. I noticed a number of people at my performance didn’t return after the interval and I can’t help but think that this production is strictly for history buffs. Running at the Theatre Royal Haymarket until September 30. Emma Cunniffe has an uphill struggle to breath strength and vigour into Queen Anne but she gives an absorbing portrayal of a royal under threat from within.